Nearly £2,500 has been donated by Canon Medical Systems UK, formally Toshiba Medical Systems, to UK charities in exchange for its radiology customers completing a short online or telephone survey about people, products and customer service. The qualitative and quantitative survey enabled the viewpoints of radiographers, sonographers and clinicians to be collected to ensure the ongoing improvement in Canon Medical System’s offerings in the areas of product support and customer service. The total amount raised will be split between three health related charities: Little Hearts Matter, a UK charity offering help to anyone affected by the diagnosis of single ventricle heart condition; The Stroke Association, a UK charity working to change the world for people affected by stroke; and a leading national Cancer research charity. 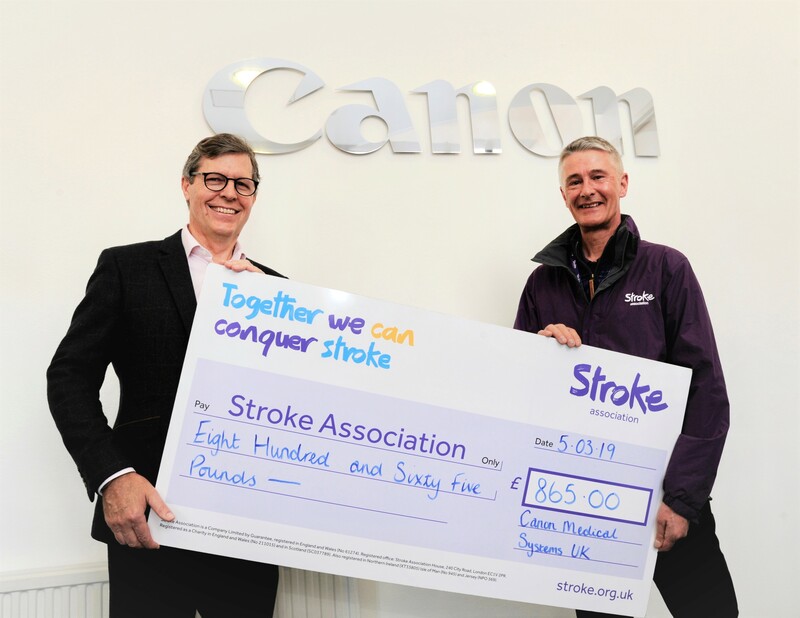 Photo caption: Mark Hitchman, Managing Director of Canon Medical Systems UK presents cheque to David Walmsley, Regional Fundraiser at Stroke Association.